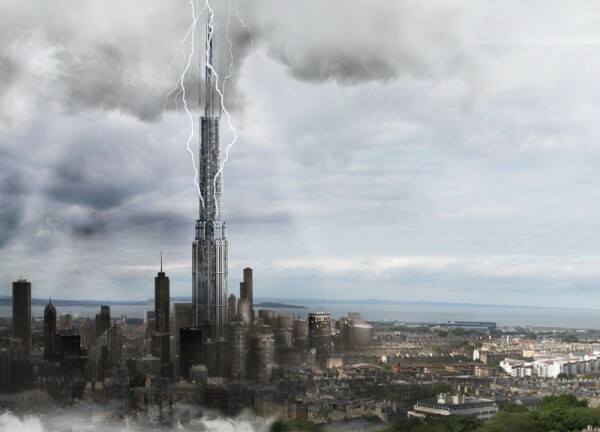 The idea behind this skyscraper proposal is to harvest the energy within clouds in regions where more than 200 days per year are cloudy and rainy such as Scotland, North western United States, and South American rain forests. According to studies, a single lightning produces comparable energy to 100,000 household bulbs for an hour. It is estimated that the world’s population currently needs 14 trillion of kilowatts per year but almost 33% of the electricity is lost during its distribution. 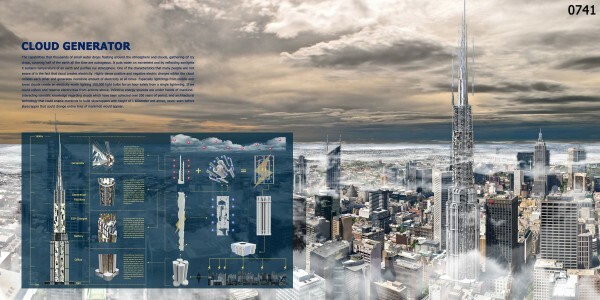 The Cloud and Electricity Generator Skyscraper seeks to tackle these problems by collecting the cloud’s electricity at heights that surpass more than 1 kilometer. 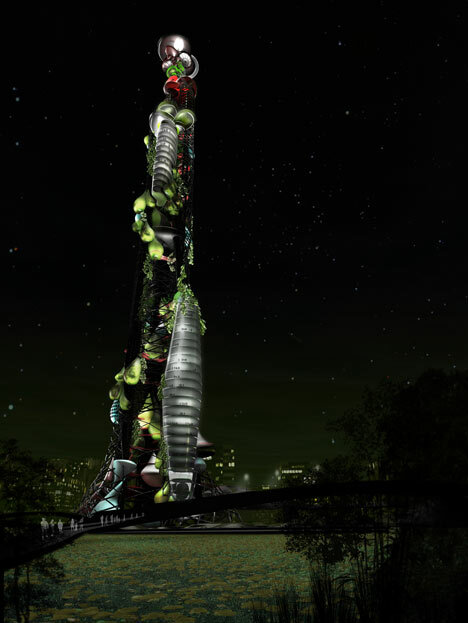 The skyscraper is designed with a series of super-tall antennas that collect lightning and stores the energy in a series of battery-like structures distributed along the entire building. A series of these skyscrapers could provide enough clean energy to a medium-size city. There will be very little energy lost in its distribution as the skyscraper will be located within the cities. 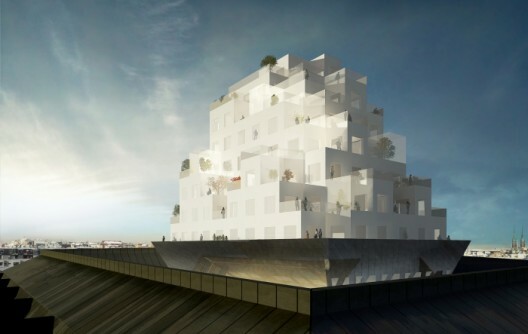 Finnish design team, ALA Architects has shared with us their latest commission, a mixed use project in Helsinki, Cloud City. Seeking to take advantage of available space within the urban core, this unique project brings density to a underutilized courtyard within a large existing factory block. 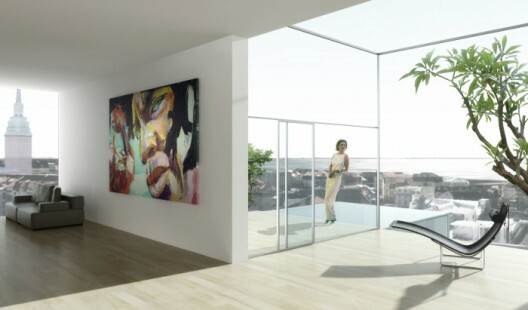 Additional images, including a full set of detailed floor plans and a description by the architects after the break. 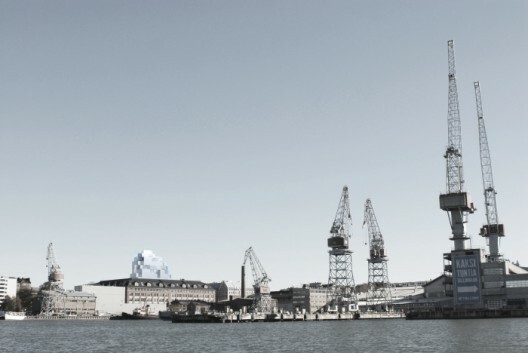 Helsinki is currently developing new sustainable methods for building the city. Primarily these projects aim at increasing density at the expense of urban sprawl. One question is how to make existing built areas denser, another where and how to build high risers. The Cloud City project is one possible answer. 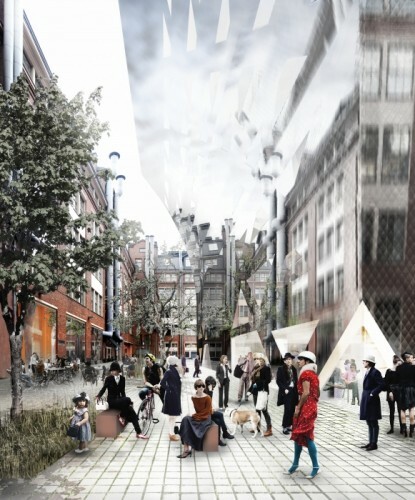 This project aims at increasing diversity in the central design quarters of Punavuori. 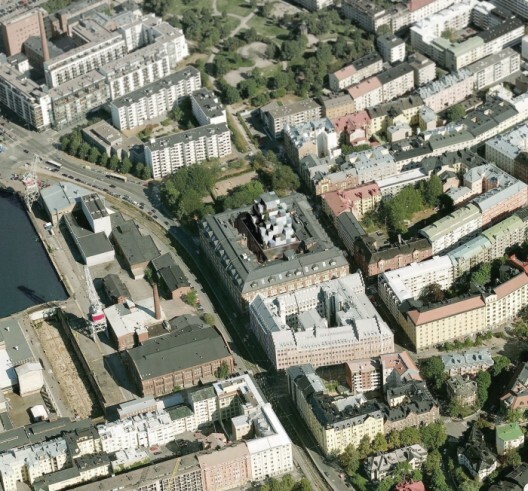 As its site, it uses the large courtyard of the 1930’s Nokia cable factory block, Merikortteli. 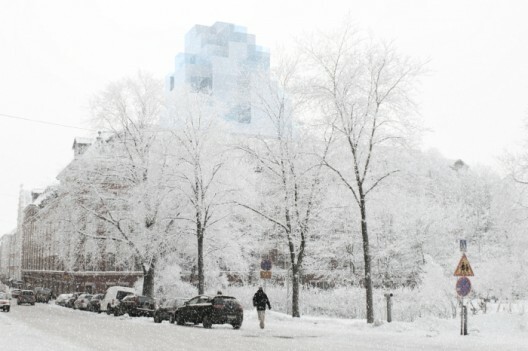 It aims at combining a single family house typology with central location and high rise views. This is achieved by using an office tower to elevate the residential building above the surrounding ridge line. The building is literally two different architectures piled on top of each other. These two identities are never present simultaneously so they can be completely optimized for their own use and conditions. Both sections have adopted a type of camouflage relating to their specific situations. The lower office section has a façade literally reflecting the surrounding brick walls, becoming a distorted reflection of its container. Its form and reflective facade direct additional light into the yard in the winter, while in the summer it provides shade against overheating. The apartments above are made up of one room sized units, creating a small scale, detached house feel. The private terraces and greenhouses give a sense of having your own garden. 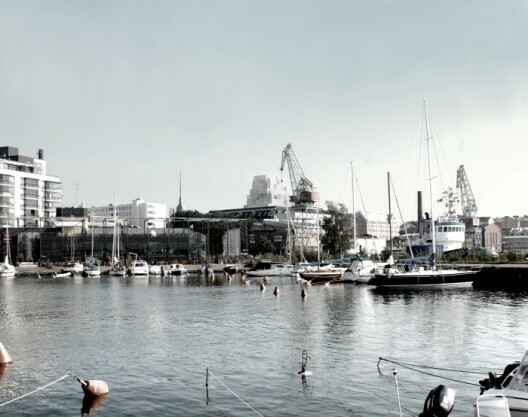 Each apartment has magnificent views to the sea and across central Helsinki. On the city scale the pixelated shape, lined by reflective glass railings and conservatories, makes the building blend into the skyline. The courtyard will be built into a lush green garden, which receives its sunlight evened out by the reflective façade of the new office building. The ground level contains public functions, spilling out through the large arcades. Above the ridgeline Cloud City has recreated the intimate scale of the old wooden houses which used to inhabit the site, whilst renewing the courtyard below into a surreal playground for the design district. Around the question of urban densification. Dr. Dickson Despommier, a former professor at Columbia University and champion of vertical farming, has released a new book on The Vertical Farm Project. 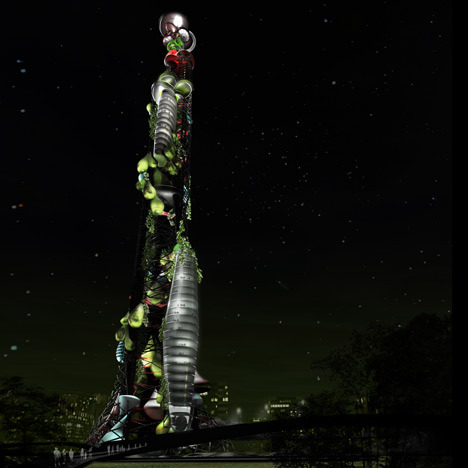 The book puts forth his argument about the future of urban agriculture through vertical farms. 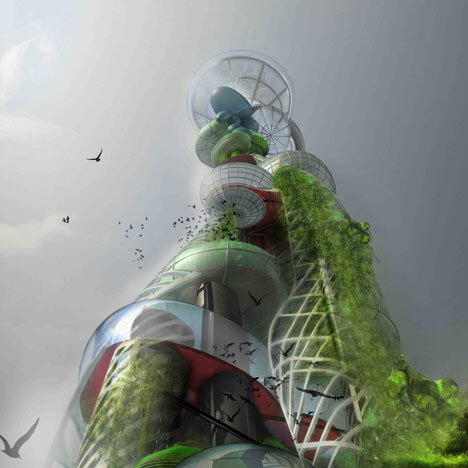 Worldchanging has covered the debate over vertical farms quite a bit (see the list at the end of this post for links), and the idea is certainly a controversial one. I've not yet read the book, but it would be interesting to know if Despommier addresses some of the challenges to the concept pointed out by others, such as the need for a proven business model for wide-scale application, and how vertical farms can grow food without herbicides, pesticides, or fertilizers and operate in a low-carbon way despite high energy needs. It's hard to tire of projects that involve wallpapering, paneling, and roofing urban structures with plant life. Though it's becoming a more common design approach for enhancing air quality, catching runoff, highlighting the "green" aspects of a building, and sometimes even providing food, it always has an unexpected effect, accustomed as we are to surfaces made with impermeable and dull materials...[the concept of vertical farming] had a recent update in New York Magazine.Since we discussed the concept, developed by Dickson Despommier, who teaches environmental science and microbiology at Columbia, a whole lot more people are on board with the climate change issue. So his proposal to put agriculture into skyscrapers and reallocate land to forests in the interested of sequestering carbon and slowing global warming now has the attention of more than just design junkies and eco-imagineers. It's become an attractive possibility to venture capitalists from all over the world. 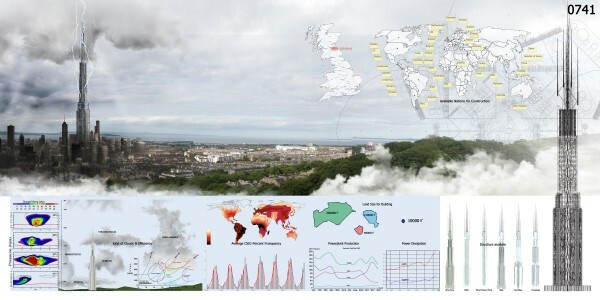 The idea factors in not only the climate aspect, but also impending population explosions, looking at taking food cultivation upwards instead of outwards as it grows to accommodate greater numbers of people . On an urban planet, closing urban resource and energy loops -- creating zero-waste systems for meeting the needs of people who live in highly dense cities -- floats in front of us, grail-like, as a goal. ¶ No one quite knows how to get it done, yet. But more and more interesting pieces of the puzzle are piling up, like smart places, smart grids and product service systems...Here's another piece of the puzzle -- vertical farming:...it's a provocative idea, and might fit together with some of the innovations discussed above in novel and worldchanging ways.